Faig Ahmed is a connoisseur of fibers, one could say. 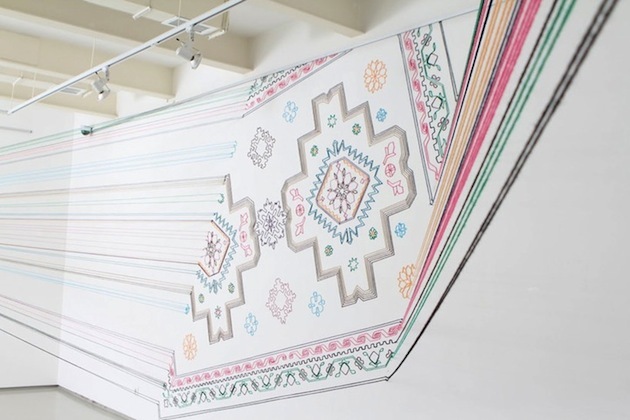 The artist typically deals in some sort of thread, carpet or fiber to create the latest and greatest works– and his latest is an amazing three dimensional carpet looking installation that lines some plain drywall. This thread installation is somewhat native looking, but all of the different threads make it over the top contemporary, especially the parts where all strings come back to a 3D point on the opposite space. The pattern displayed is a beautiful composition that sits diagonally complete with varying pink, blue, brown and other neutral hued yarns. See more of Faig’s work on his website.